In the video accompanying the artwork Fish Hammer, a small goldfish – dubbed Smashie by UK-born, New media artist Neil Mendoza – can be seen tentatively exploring an aquarium. In the foreground there is an array of dollhouse furniture, above which a hammer looms ominously. Though Smashie himself is unaware, there is also a camera which connects his movements through the water to the hammer by way of motion tracking technology. It results in the hammer moving back and forth in tandem with the untroubled fish and eventually crashing down on the miniature tables and chairs beyond the tank. For Mendoza, it is both a gleeful empowerment of marine life to attack human habitats (a tongue-in-cheek response to the anthropogenic damage suffered by our oceans every day) as well proof of an enduring fascination with art and technology. 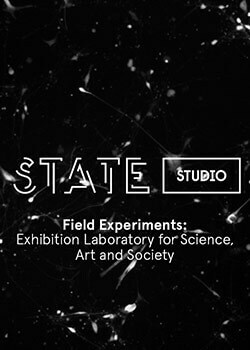 The interest to cross-fertilise these two fields can be traced throughout not only his artistic practice but in his academic career as well, having completed a degree in Math and Computer science at Oxford University before acquiring an MFA in Design media art from UCLA. It was also in his now home California that Mendoza participated in the Pier9 residency hosted by the digital fabrication workshop Autodesk. 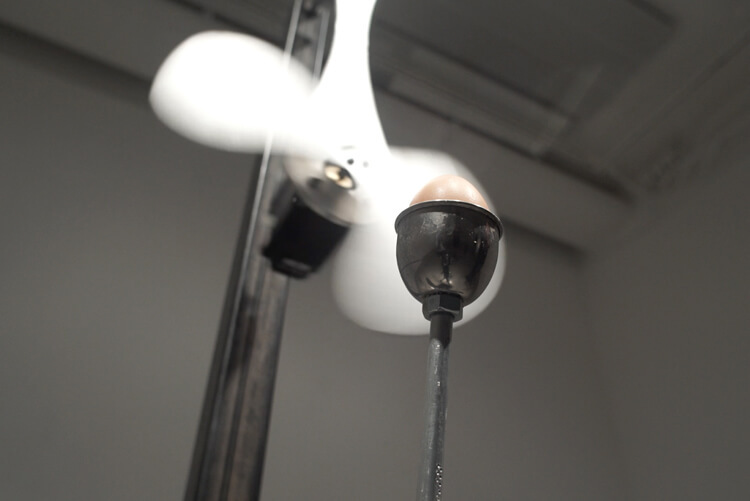 In his artworks this interest manifests in a number of widely exhibited kinetic machines and installations that breathe life and movement into otherwise inanimate objects and spaces. Some of these artworks express humour and whimsy, such as the orchestral Rock Band, which contemplates the everyday life of rocks with an ensemble of electromechanical instruments, using little stones to perform Here Comes the Sun. 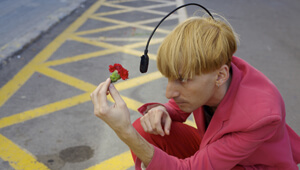 However, there are also installations which touch on the more anxious relationship human beings have with technology. 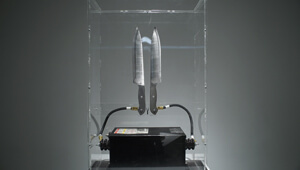 For instance in another sound-producing work, The Electric Knife Orchestra, the audience is presented with six musical machines made up of sixteen kitchen knives and a single meat cleaver. As the artwork whirrs to life, the machines have been programmed in such a way that the synchronised noise of their motions perform a tinkering edition of the Bee Gees’ hit Stayin Alive. 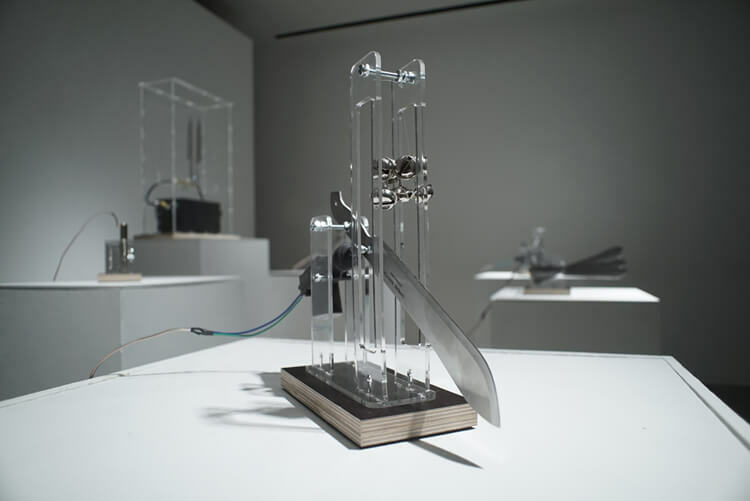 Though forthrightly playful, the choice of song and implied threat of the blades also give the installation an apprehensive undertone. Similar tension is palpable in the artwork Eggistential Angst, where a pendulum and an egg – though carefully designed not to crash together – engage in a perilous swerving dance. Even though the process is controlled by technology the brittleness of the egg so narrowly avoiding collision with the large clunking machinery remains stressful to witness. Ultimately technology has, to quote a Jonathan Coppersmith article from The Guardian, made us simultaneously both hyper-capable and helpless consumers . The result is that now our innovation is consistently undercut by our dependence on everyday machines. However, while the artworks designed by Mendoza can ask questions concerning the role which machines now play in our lives, they, more often than not, also highlight the creative, funny and artful possibilities of digital design. It reminds us that we are not only mindless users, but makers as well. 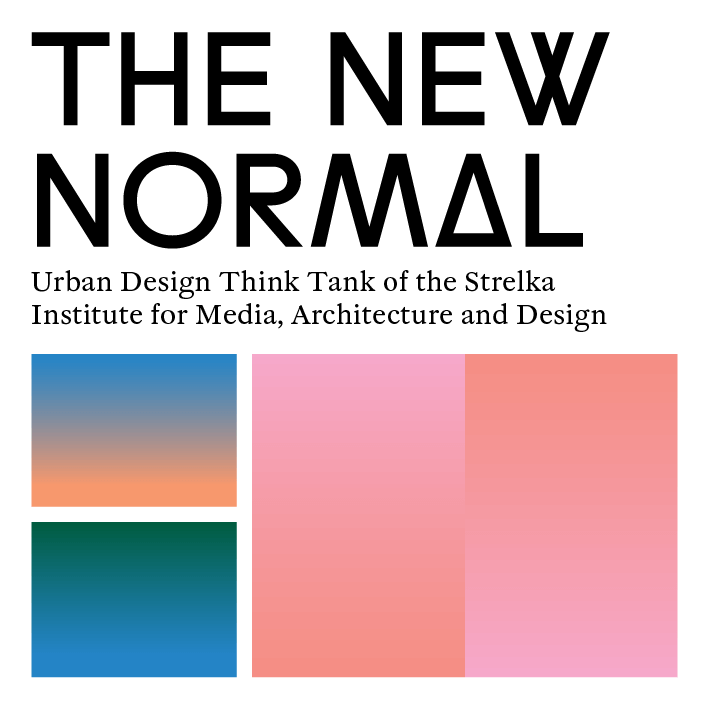 One of the main themes in your work is the use of digital and mechanical technology to question the role of gadgets in our society and lives; could you tell us a little bit about the intellectual process behind? We are surrounded by technology but it’s so ubiquitous that we become normalised to its presence, no longer noticing it or considering its possibilities. I try to create work that lives outside of the default paradigm of networked screens. By using technology in surreal and absurd ways to create complicated, useless machines I hope to circumvent this normalisation; to create experiences that spark people’s imaginations, encourage real life interaction and push people to think about futures outside of the obvious. ‘One Degree of Freedom’ explores interactive projection mapping as a means to touch and interact with a gadget or object. How people respond to multiple stimuli in a digital environment beyond the touch of a screen or button is one of the questions to answer in this 21st century in which people live in a hyper-connected society. In which ways do you think are interactive and digital technologies changing or affecting human behaviour? I feel like digital tools, despite their amazing power, have a homogenizing effect on our thought processes, both in the processes of creating and consuming of media and information. Our every act in the virtual world, from accounting to drawing to researching flowers, is mediated through the same devices, the keyboard, the mouse or touchscreen for input and the screen for output. In my own practice, I try to take a step away from devices and start with ideas. It’s easy to get people excited about things they’ve never experienced, such as VR. However, if they’re excited about a platform, rather than the content you’ve created, it’s impossible to know whether you’ve created a successful piece or not. You have been one of the artists in residence at Autodesk Pier9. What were the biggest challenges you faced during the residence? The residency is amazing and provides everything you could want in terms resources. That means that the only constraint is your imagination. With almost unlimited possibilities for creating awesome work, the biggest challenge is trying to work out what best to spend your time doing there. 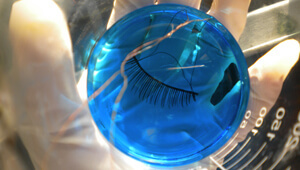 Do you think being part of Pier9 and working closely with other artists will reshape the way you approach the art form? My cohort at Pier 9 came from a diverse range of backgrounds and I think that having such a varied range of pool of ideas around was definitely inspirational. It’s also an amazing environment for learning new tools and techniques that I will definitely be using in my work going forwards. What is your chief enemy of creativity or creation? Email is one of my biggest enemies. It would be totally possible to spend all day every day taking care of administrative nonsense if you had nothing better to do. Trying to filter out the signal from the noise and not get distracted is an art unto itself. Yoga, I find it’s a great way to get out of your head and away from technology for a while.